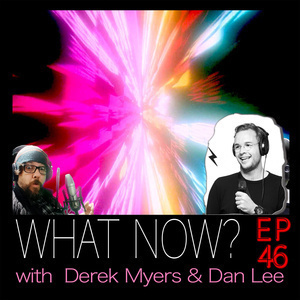 Josh Janssen from the Daily Talk Show | What Now Derek? Josh Janssen, international podcaster joins Derek while Dan is away. Josh, who partners with Tommy Jackett on The Daily Talk Show and Big Media Company, talks with Derek about our similarities and differences as podcasters. The Importance of a tech setup and how that varies depending on each persons personality type. Derek fills in the weary traveller on highlights of OzPOD 2018, an ABC organised National Podcasting conference. (which was great BTW) A long day in the saddle was well worth it, from an insight into the big time podcast production styles through tech and sound engineering to Indy podcasters explaining how and why they got started. Josh admits he suffers from premature Lanyard donning. Dan's absence (and very good looks) is noted. We will let him tell us why he is away... It is a SCOOP.,..... We start rolling into tech talk, apple mac talk, leading to discussing Fortnite and how it is hitting Tarquin's parents hard. Perfect little tarquin is showing signs of addiction with lying and anger management issues. Derek discusses his theories on unorthodox parenting and how it increases the risk of high achievement as well as increasing the risk of causing behavioural problems. Mainly as the kids may not think and BE the same as the parents. Shepparton cops it again. We bond over being Lunch order Kids. Josh wins as his mum gave him play lunch too. lucky duck. Josh worries about bringing a kid into a doomed world, and Derek says "breed an army of world saving post-millenials" We had better get ready to be despised by future gens. Veganism. Why are we discussing veganism? Derek's shopping bag guilt... we shall get there in the end. Habit changing and how to do it. The more common the addiction, the harder it is to give up. That's why sugar addiction is the big danger, as it is not only available everywhere, but advertised and is VERY similar to what you have to eat just to stay alive. Changing potato fries to sweet potato fries can be the simple change that taught a guy to be able to change more with confidence. What makes a guy take time out podcast every day of a dream holiday with his lover? Josh explains the answer.